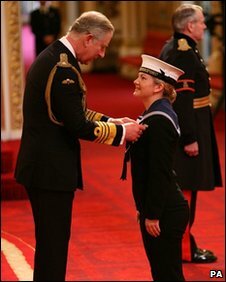 The 21-year-old medic was cited for "courage under fire"
A medic from Devon, who is the first woman in the Royal Navy to be awarded the Military Cross, has been presented with her medal by Prince Charles. Able Seaman Class 1 Kate Nesbitt has been recognised for braving Taliban fire to tend to a soldier shot during a gun battle in Afghanistan. The 21-year-old medic, from Whitleigh in Plymouth, was presented with the medal at Buckingham Palace. After the ceremony Ms Nesbitt said it had been her "proudest day". "It made it all seem real being here today. It has been so special," she said. "When I looked over and saw my mum and dad in the audience, it was the proudest day of my life." Ms Nesbitt is only the second woman in the Armed Forces to receive the medal. But the modest medic said: "I was really overwhelmed that they trusted me to do the job and never doubted me at all, that's what was important." "I just did what I'm sure everyone else would have done for me." During her deployment to Afghanistan, Ms Nesbitt was attached to 3 Commando Brigade whose medical support is provided by members of the Royal Navy. She dressed L/Cpl John List's neck wound and kept him from losing blood while bullets and rockets flew overhead in Marjah district in Helmand. Earlier this month, L/Cpl List said no words could describe what Ms Nesbitt had done, but without her action he would not have lived. Her citation said: "Under fire and under pressure her commitment and courage were inspirational and made the difference between life and death. "She performed in the highest traditions of her service." The first woman in the Armed Forces to receive the Military Cross was Private Michelle Norris, of the Royal Army Medical Corps, who saved the life of a colleague during a battle in Iraq in 2006.